Attention spans in the age of social media are rather short and immediate issues almost always catch more eyeballs. As India gears up for the 2019 elections, attention will inevitably shift from recent international events to the festival of democracy. Familiar issues will be raked up, and people will forget that just a couple of weeks back two nuclear-armed belligerents engaged in direct aerial combat for the first time in history. South Asia has survived numerous nuclear-tinged crises from exercise Brasstacks in 1987 to the latest incident that ended with India and Pakistan downing a fighter jet each. When viewing these crises cumulatively, one would be tempted to draw the conclusion that both India and Pakistan are sagacious enough to avoid an escalation spiral. Successful coexistence is, however, contingent on each surviving forthcoming crises, and only the one that hasn’t arrived yet matters. Crisis management is therefore essential, especially for India to realize its strategic potential to the fullest, by striving to take advantage of its demographic bulge, developing industrial power, and achieve economic prosperity. In that context, the now-dormant national security adviser (NSA)-level channel between the two sides could be essential to ride out such crises in the future without risking a major war. Fundamental conditions that lead to this latest crisis are unlikely to change soon. Pakistan has engaged in familiar legalism in the face of international pressure while China has steadfastly defended its ally’s use of militancy as a means of power projection. The communication of violence that India receives from across the border is a result of the existence of militant infrastructure as much as it is the result of a lopsided civil-military balance of power. These structural factors are unlikely to be corrected in the short term. On the other hand, India’s responses after Uri and Pulwama and going public with them has lowered the threshold for military reaction. In fact, whichever political configuration comes to power in the forthcoming elections, not responding militarily in the face of provocation may not be an option. Crisis trajectories are therefore tied to the political cost of inaction or action thereof. If both sides tie themselves into a commitment problem, then an honorable political end-state for both sides is necessary for de-escalation. This time the exchange of a captured Indian pilot seemed to end perfectly well for both sides: Pakistan could act magnanimously and India could claim the return of the pilot as an outcome of coercion. If, however, this were not to be the case, then whether de-escalation still have followed immediately is a matter of conjecture. That this crisis too was nuclear-tinged could be gauged from the signalling both sides engaged in. Pakistan’s National Command Authority convened on February 27, 2019, while the Indian Navy later stated that it had operationally deployed “nuclear submarines,” although at this point it is not clear if this included INS Arihant, the only operational nuclear-weapon-capable nuclear ballistic missile submarine (SSBN) with the Indian Navy. It is therefore necessary that the risks are mitigated with a view toward building negative peace: avoiding the occurrence of a major conflict by riding out a crisis moment without engaging in a serious military exchange and thereby dampening growth prospects. This would require a two-pronged strategy: one where the intervals without a major terror incident are prolonged and, second, when such an incident does happen, leading to a crisis situation, then enough political space can be conjured up for a successful exit from the crisis state. This space can be crafted if a channel for communication exists not just during a crisis but during the interregnum of peace that exists between this crisis and the next one. Previously, crisis-related communication between the two sides at the military level has included telephone calls between Military Operations (MO) directorates, or talks between the Directors General of Military Operations (DGMOs) to communicate in matters of urgency. 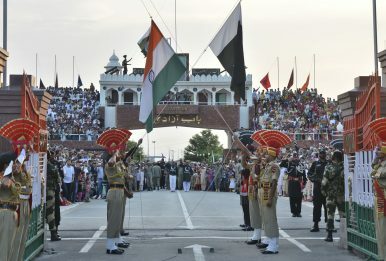 The diplomatic channels, though, become the first casualty when the crisis moment arrive, or are simply ineffective because of the unique civil-military equation that rests on the Pakistan side. These channels are good at the tactical level; however, once the crisis ball is set rolling, devoid of political heft, they do not provide for the communication required for the sort of bilateral handling that might ensure crisis stability. Until now, this has generally happened through the good offices of third party states like United States or the United Kingdom that have enabled communication during crisis, but the importance of direct bilateral communication between two warring sides that are in possession of nuclear weapons cannot be understated. Third-party channels are activated when a crisis is on the horizon, but a bilateral channel could continue to remain operational during peacetime and be ready to respond to a crisis with the urgency it demands. This is where the now dormant NSA channel could be of immense value. The last time Indian and Pakistani NSAs met was in Thailand on December 26, 2017. In total, they met four times and held numerous official and unofficial phone calls. These meetings were held in third state territories, with three held in Thailand and one in Russia. The last meeting, due to be held in July 2018, was cancelled after Lieutenant General Nasser Janjua resigned. Since then, the NSA post on the Pakistani side has been vacant. Earlier in February 2019, Dawn had reported that Prime Minister Imran Khan was considering Brigadier Ijaz Shah for the job; however, the official spokesperson for the PM had denied the existence of any such proposal. The NSA-level dialogue has distinct benefits. First, NSA-level talks are neither an eyeball catching event nor a secret back-channel that will exclude constituencies important to the decision making. Second, NSA-level talks are also not a concession because they don’t necessarily require a pre-set objective and could simply strive for crisis prevention or, in the event of a crisis, help in communicating intent clearly. Third, unlike the Comprehensive Dialogue Process (CDP), the NSA-level talks do not get stalled by the “terror first versus talks first” pre-negotiation or degradation of diplomatic level ties. And fourth, most importantly, the NSA on the Pakistani side can be assumed to have the confidence of the military establishment and this therefore allows for looping in constituencies that are critical to the decision-making and communication process during a crisis. Finally, NSA-level communication is relatively insulated from the hyperbole and political statements that are made across the political spectrum on both sides because there are no direct political costs involved. Achieving conflict resolution between India-Pakistan may be a difficult road to travel but achieving a modus vivendi is not. India-Pakistan would do well to realize the value of negative peace and cultivate it as a strategic good for both sides. If Pakistan appoints an NSA, and it must, both sides would benefit from reactivating the channel to exchange views on national security issues. Despite the adversarial state of relations, it is an imperative for the two states, and more so for India, to avoid getting involved in a major military showdown that could severely peg back economic growth at a time when it confronts a serious job crisis. In the meantime, India could invest seriously in counterterrorism and intelligence capabilities to avoid the prospect of a major attack. If a crisis moment does arrive, the NSA channel could help understand the military intent and communicate its limited nature clearly even as the two sides engage in manipulation of risk and signalling to national and international audiences. Joy Mitra is a fellow in the Asia-Pacific program at the EastWest Institute in New York and a former visiting fellow with the South Asia program at the Stimson Center in Washington, D.C. He tweets at @sysandstrat.